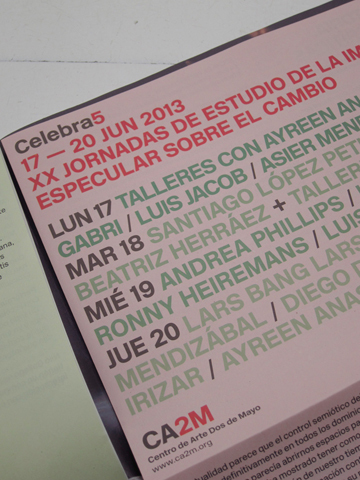 Participants: Ayreen Anastas & Rene Gabri, Lars Bang Larsen, Diego del Pozo, Susanne Husse & Lorenzo Sandoval, Fritzia Irizar, Luis Jacob, Santiago López Petit, Asier Mendizabal, Andrea Phillips, Katrien Reist, Renée Ridgway, Vermeir & Heiremans. For the 20th anniversary of the annual 'Jornadas de Estudio de la Imagen', head of public program Pablo Martinez invited Vincent Meessen for the second year in row as co-curator for this symposium. The 'Jornadas' focus on a young and emerging group of most Spanish art practitioners and bring them together with a group thinkers, curators and artists to intensively exchange knowledge and experience around an actual subject. Speculating on Change will look closely at the artistic practice both as a speculative tool and operational tactic for reflecting the values that shape contemporary art today. The participants will discuss the opportunities art practice offers to invoke change in the existing system by means of critical reflection and the introduction of possible ways of thinking and handling. Speculating on Change closely connects to the themes Jubilee brought up during the debate The Value of our Love at Art Brussels. Vincent Meessen and Pablo Martinez choose to invite both Katrien Reist (as a responder to Renée Ridgway's presentation) and Vermeir & Heiremans with the presentation of their performance Art House Index. For the detailed program, read more here.